Shearling coats are typically made with processed lambskin, sheepskin or pelt. The shearing process creates a uniform depth of the wool fibers to create a uniform look and feel. Shearling coats and other garments are made from pelts by tanning them with the wool of uniform depth still on them. Results make for a natural, soft fleece fabric that is lightweight and comfy. The coats often contain insulated lining, too. They are not only lightweight, but very comfortable and stylish, too. 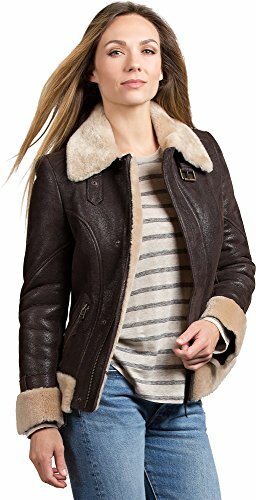 Shearling coats are considered luxurious due to the high quality and uniqueness of them. The lighter the Shearling is, the higher quality it's considered to be. 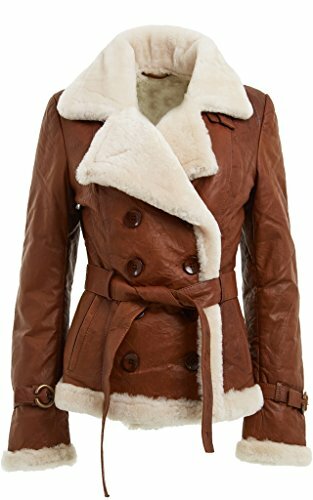 Featured here you will find beautiful Shearling coats and jackets for men and women. Stay warm and stylish all winter long. 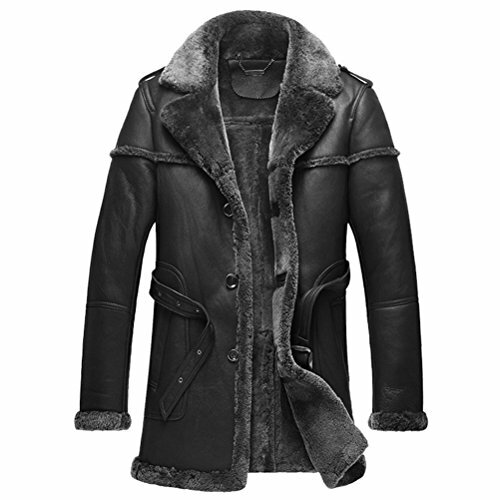 Men will love these stylish, warm Shearling jackets. Great for fall or winter! ​Choose from a variety of styles, colors and sizes. These jackets make awesome gifts for all the special men in your life, too. 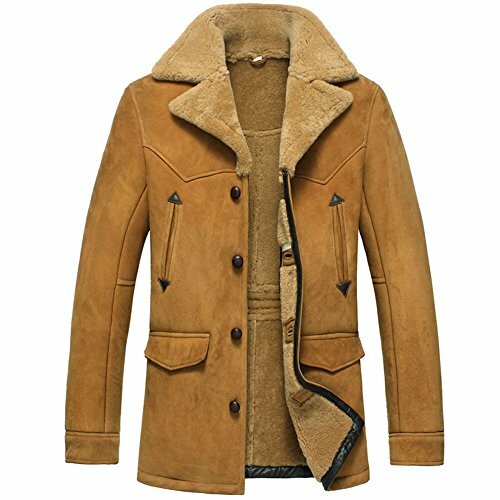 Jakewood Men's Genuine Shearling Sheepskin Fashionable Classic Winter Jacket . 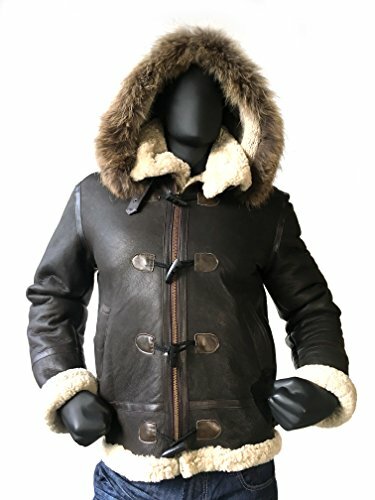 This sheepskin jacket is made with 2-sided sheepskin (shearling sheepskin or double face sheepskin). The exterior side has a durable leather finish and the interior side is soft warm sheepskin wool. Shearling sheepskin is one of natures warmest insulators, its natural breathable leather and wool is great to keep you warm but not sweaty. Made in USA. These Shearling coats for men are ideal for winter weather, or anytime you want to shield yourself from chilly winds. ​Choose a length and color you love, and step out in style and warmth every day. This stunning double breasted tan leather jacket exudes style. Crafted from butter soft Spanish Merino leather this jacket is undeniable chic. The attention to detail on this garment is immaculate, featuring a silky smooth Merino sheepskin collar and lining to help keep the cold at bay. 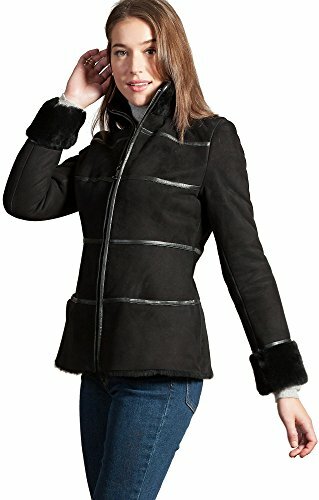 The stylish peacoat design features a double breasted front, notched lapels plus buckled leather straps that provide a more tailored fit. The fine shearling border defines our striking sheepskin coat. Perfect for evenings, delightful for everyday wear. This feminine, button-front design is a premium winter defense, thanks to plush shearling insulation that holds in body heat, and the stand collar that deflects wind and chill. Slash pockets. Weight: 2.92 lbs. 34" long. Made in the USA. Shearling jackets are perfect for chilly fall days or nights. These styles will knock your socks off. ​ You'll stay warm in ultimate comfort during fall and winter seasons every day of the week. ​Warm, cozy fashion never looked better. The Batavia Shearling Sheepskin Jacket surrounds you in luxurious shearling sheepskin with a crisp design that raises sporty to a new level. Plush Australian sheepskin is naturally lined in dense shearling for insulation that takes the worry out of winter. The shearling outsweep makes a rich contrast with the smooth sheepskin leather, fashioned with a wide placket that hides a double snap-and-zip closure for extra warmth. A buckle strap that fastens the shearling collar is echoed at the decorated cuffs. And zip hand pockets finish the look of this beautifully paneled aviator jacket that flatters and insulates all season long. Weight: 3.4 lbs. 24" long. Made in Turkey. The marriage of warmth, chic, and Spanish sheepskin has got you covered this season. Our zip-front Jordan jacket adds horizontal leather detail to premium sheepskin for a unique and flattering design. The tall, soft, shearling collar echoes the wide shearling cuffs and shearling-trimmed raw edge hem, while shearling insulation defends you from the cold. Lambskin leather piping and trim. Hand pockets with magnetic closures. Weight: 2.3 lbs. 26.5" long. Made in Turkey. Stay warm in cold weather with these Shearling coats for women. They make great gifts for any occasion, too! You'll love the soft, comfortable Shearling additions, and the style of these coats are beyond compare.